Papal Crucifix by Ado Santini in hand-painted alabaster and resin cross and corpus, 24.5inches. Made in Italy. Gorgeously detailed large Crucifix by Ado Santini with a hand-painted corpus and a wood cross with a reinforced hook, 46inches. 31.5" wide. Made in Italy. Crucifix in hand-painted alabaster corpus and cross, 11.5 inches. Made in Italy. Crucifix with gold plated cross & silver plated corpus, 11inches. Made in Italy. 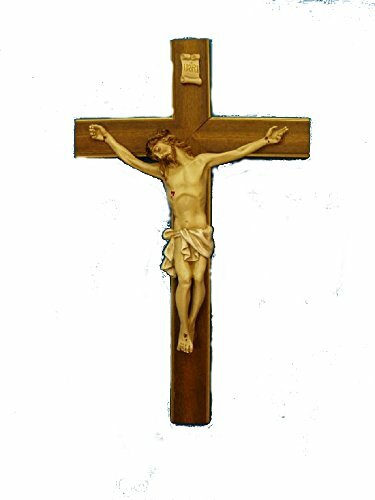 Crucifix with gold plated cross & silver plated corpus, 14inches. Made in Italy. Standing antiqued brass crucifix, 14 inches. Made in Italy.